I haven’t even starting building pens yet and have already had to make adjustments in my plans. In formulating my plans to build new pens, I decided I would take the small gate off the post which had been sunk into the ground in the former sheep pen.The gate was to a smaller pen built in the corner which will be dismantled. I planned on putting the small gate at the east end of the 4 foot alley I was creating in front of the kidding jugs. I was then going to rebuild the former sheep pen only to the post – making the pen about 8 feet shorter. However, while I was able to remove the nuts, I wasn’t able to get the bolts to slide back through the tie. So my next bright idea was to just dig up the post and move it – and the gate – to the new location. My problem now is that I don’t remember how deep we buried the bottom of the post. I – with help from Fix – have dug down about 10 inches and can’t dig any deeper until the T-post next to the post is removed and I can’t remove the T-post until I have another pair of hands. 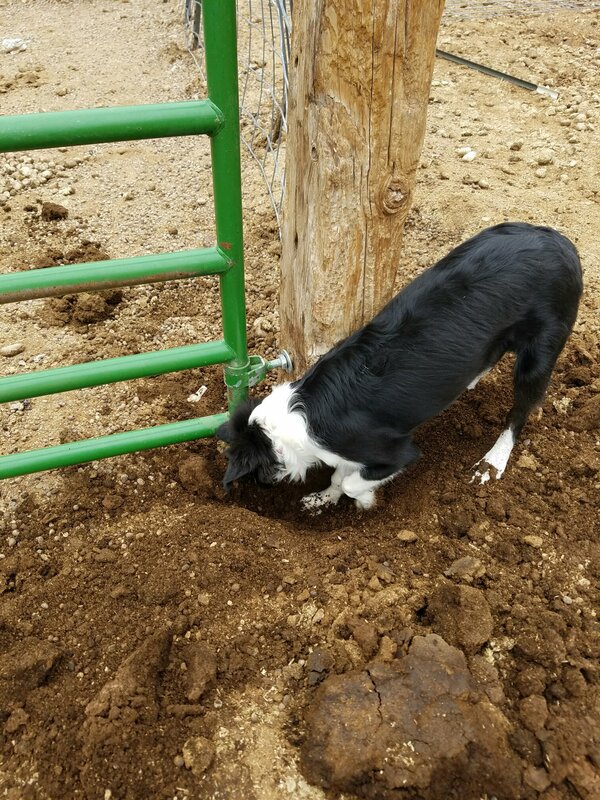 As helpful as Fix is trying to be, he just isn’t up to the task of holding the cattle panel away from the T-post so I can use the T-post puller. This entry was tagged Fix, Goats, Quibeyn Farm. Bookmark the permalink.